This gorgeous Buckley London ring, hand set with a flawless brilliant cut stone surrounded by intricate millgrain will add a touch of elegance to any outfit. 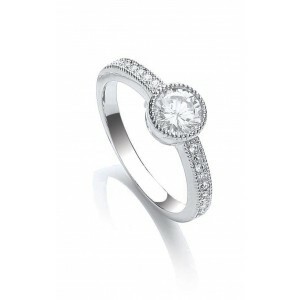 Plated with pure Rhodium, this heirloom inspired ring is a must have for any season. Matching earrings (CZE986), pendants (CZGN241/CZGN244) and bracelet (BT740) are also available.